Today's decluttering mission is to declutter pencils and pens. 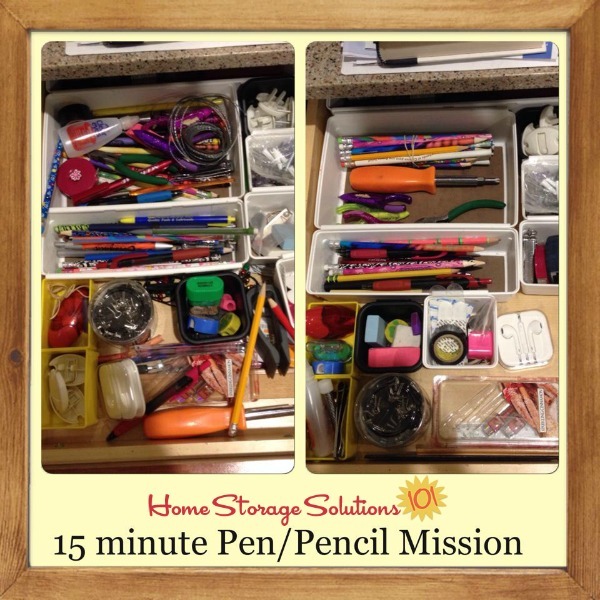 You can do this mission as part of the larger organizational challenge to organize your home office. Obviously, don't get rid of the pencils and pens you own, but I know I'm a bit of a pen collector, and I often accumulate too many. Get rid of any that don't work, or have run out of ink, or if, referring to pencils, they're too beat up, chewed up, or short as to not be useful anymore. Start at your desk in your home office, but expand your search to anywhere in your home where you keep some of these writing instruments. Also, I tend to accumulate pens in my purse, so I periodically have to take out a few so it's not ridiculous in there. You know your own spot that has way too many pens. 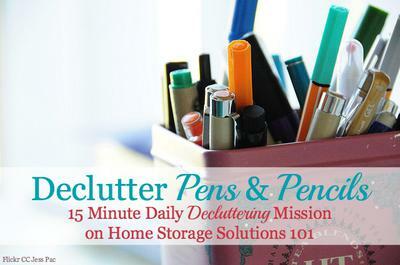 Take the time while you're decluttering to also put pens or pencils in spots that you always seem to need one, but for some reason there aren't any. Prime example, make sure you've got one near the phone, next to a small pad of paper, so everyone can take a message if necessary! Tell me in the comments how many you decluttered, where you never can find one in your home, but wish you kept a few, and/or where you tend to accumulate way too many of them. 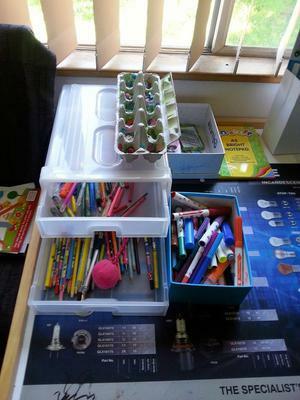 Below you can see some pictures from other readers who've already taken this challenge, showing both the pens and pencils they decluttered and also how they organized the pens and pencils they had left. Lots of readers have done this quick mission and sent in photos of their results. Above a reader, Kelly, sent in a collage of before and after shots. 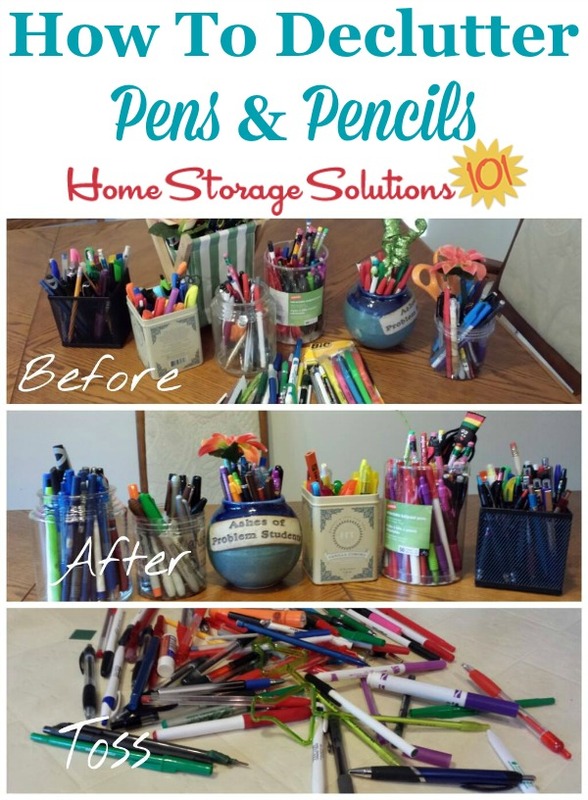 She explained, "I tossed loads of pens that no longer work and organized the rest. Wow! It took a while, and a think that I need to avoid office supply stores." Regina sent in the photo above, showing her before and after results, saying, "It's the little things. Thank you Taylor for giving us these 15 minute missions. I set my timer and voila. 😍 This makes me happy since it gets to be a mess after the kids dig around." Above is the before and after results Brandy got when she did this mission! This photo is from Windy, who said, "My office organizing is taking a long time but will be done well in the end. I have separated paper from other and now writing utensils from other office supplies. I know I decluttered pens and pencils about a year ago getting ready to move. How is it that after the move I have a 12"x"15"x8" box of writing utensils even after every reasonably placed pencil cup has a few of each needed item?" 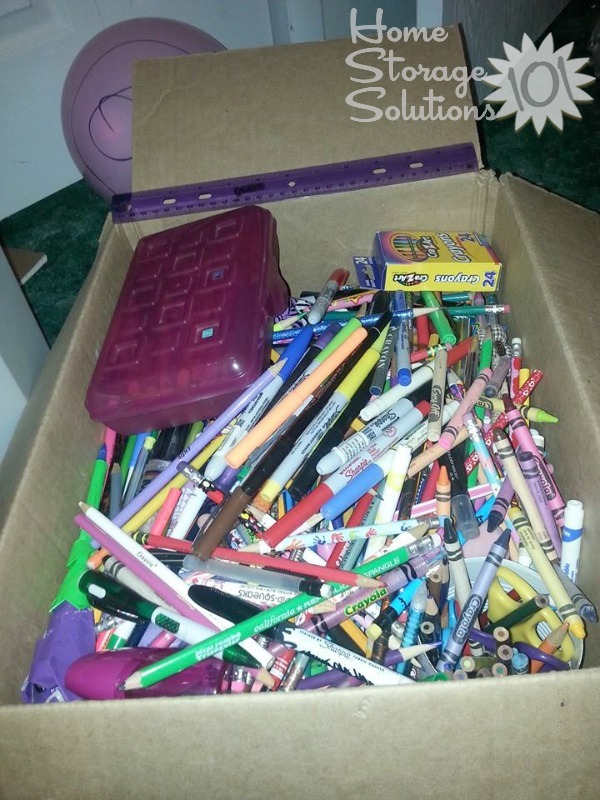 Finally, this last photo is from a reader, Holly, who said, "Pens, pencils and erasers going to a middle school." Once you've gotten rid of all the writing implements that no longer work or the just excess amount if you had too many, make sure you think about where you'll put the rest. Finding a pen or pencil when you need it may not seem like a big thing, and in the grand scheme of things it really isn't, but not worrying about it, wasting time searching, can just make you feel better. And since it's really simple, why not? The photo above was provided by a reader, Kylie, who said, "I have all my stuff and my daughter's all in one area. I did this for her the other day." 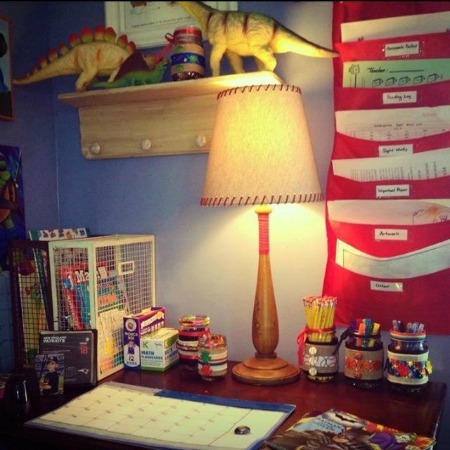 In addition, here's another photo submitted by Jackie, who explained she uses mason jars to organize pens and pencils on her son's desk. 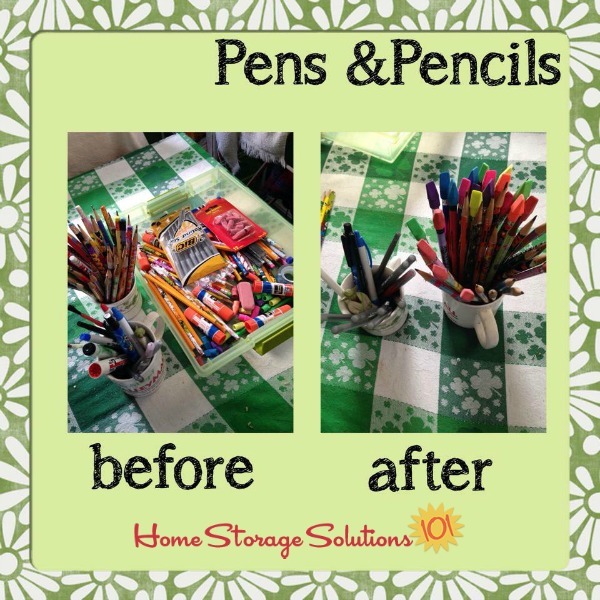 There are lots of ways you can organize writing utensils around your home. 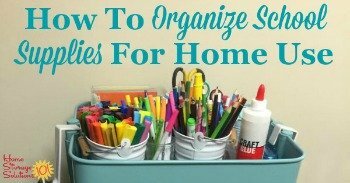 For more ideas check out these 3 ideas for how to organize school supplies to help you keep them ready for use! 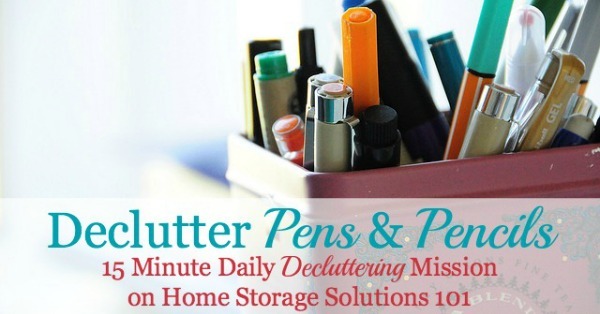 I hope this simple mission has inspired you to declutter all the parts of your home office. Where I never can find a pen! My purse is the one place I never have one! 1. I have two in each bathroom with a pad of paper next to the "thinking chair"
2. I have two by my bed with a pad of paper for those last minute thoughts before falling asleep and forgetting everything. 3. I have a few in kitchen for grocery list and my children running out the door asking for a pencil for school. 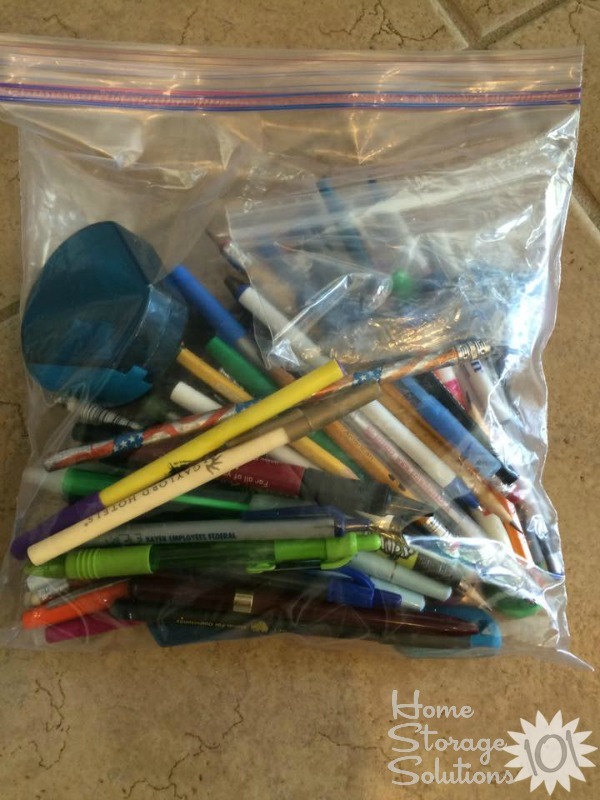 When I worked in a high school library as a clerical aide I would bring in extra pens and pencils that had accumulated in our house and place in a container at the circulation desk. Amazingly the pens and pencils would disappear because students always needed a writing utensil. I felt like it was a good way to declutter my house and help others at the same time. pens where you need them! I put a pencil cup (from Target dollar spot) on my end table next to where I sit. I have diabetes and need to record my blood sugar numbers. Until I put cup on table I was walking around with blood on my finger looking for a pen! Point is, put them where you need them. If you have a favorite restaurant, take your excess (working) pens to them. Servers are always in need of pens! The public library is my go to place for excess working pens and pencils. Even little pencil stubs are welcome and given a second life.